The human rights organisation Amnesty International has called on Egyptian authorities to release people imprisoned for peacefully expressing their opinions and to end legislation that has allowed the state to clamp down on freedom of speech in the country. In a new campaign launched on Thursday, titled Egypt, an Open-Air Prison for Critics, Amnesty said that Egyptians are living in a time of “unprecedented severity” amid a government crackdown on freedom of expression. Since December 2017, the rights group has documented at least 111 individuals who have been arrested by the National Security Services for criticising Egyptian President Abdel Fattah al-Sisi and the general human rights situation in Egypt. “It is currently more dangerous to criticise the government in Egypt than at any time in the country’s recent history,” Najia Bounaim, Amnesty’s North Africa Campaigns Director, said in a statement. “Egyptians living under President Sisi are treated as criminals simply for peacefully expressing their opinions,” she said. Bounaim called the security services “ruthless” in their suppression of independent political, social or cultural spaces. There was no immediate comment from the Egyptian government on the Amnesty statement, but Cairo authorities have a track record of indignantly dismissing criticism of the country’s human rights record as fabrications. It routinely accuses advocacy groups like Amnesty or Human Rights Watch of being unprofessional or tools in the hands of Egypt’s enemies. Egypt, the Arab world’s most populous nation with some 100 million, has launched a massive crackdown on dissent in the five years since the military removal of a freely elected but divisive Islamist president, Mohamed Morsi. The government has since arrested thousands of his supporters along with secular activists, placed the media under tight control and suppressed freedoms. Egypt has recently adopted a law that empowers the state’s top media regulatory agency to use the “fake news” label to shut down social media accounts with more than 5,000 followers, without having to obtain a court order. Another new law allows blocking websites with content deemed a threat to national security. 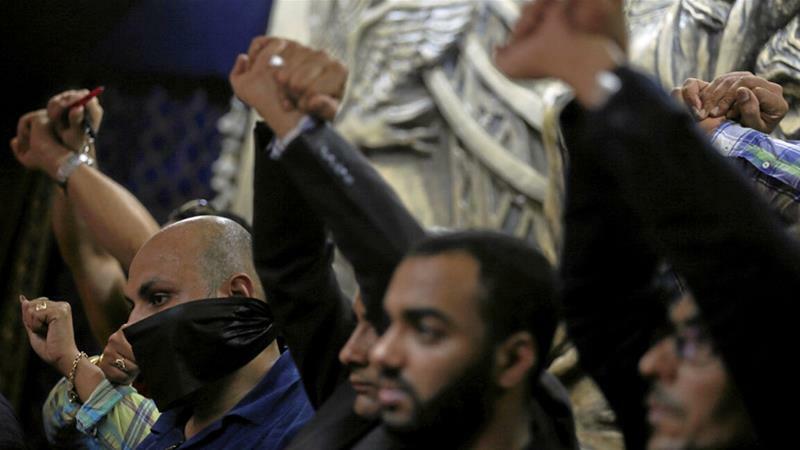 Egyptian measures to silence peaceful voices has prompted hundreds of activists and opposition members to leave the country to avoid arbitrary detention, the rights group said. Journalists, opposition members, artists, comics, and football fans have all been jailed for speaking up under vaguely defined laws. “Despite these unprecedented challenges to freedom of expression, and despite the fear which has become a part of daily life, many Egyptians continue to peacefully challenge these restrictions, risking their freedom in the process,” Bounaim said.